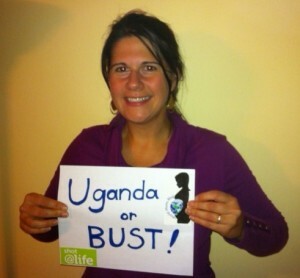 World Moms Blog founder, Jennifer Burden, is headed to Uganda soon with the UN Foundation’s Shot@Life campaign! Last week I got the e-mail…”We have had a spot open up on our observation trip to Uganda (which is in two weeks), and we thought of you.” I had less than 24 hours to decide to accept the incredible invitation from the UN Foundation, and before I knew it, I was reading every travel advisory for Uganda under the sun. The Shot@Life trip will be observing UNICEF’s bi- and tri-annual Family and Child Health Days, where children are given Vitamin A tablets to boost immunity and prevent blindness, deworming tablets to treat parasitic infections, routine polio and measles immunization, monitoring for nutritional status and insecticide treated mosquito nets to prevent malaria. There will also be visits to other routine immunization clinics, schools, places of worship and other places in rural Ugandan communities. Could I leave my girls, 5-years old and 19-months old, for a week? They would be just fine for one week. Remember all that stuff you’ve told yourself about teaching social good to your children by setting a good example? Well, this. Yes, this. Who would watch them? My husband and my mother stepped in. Awesome. An opportunity like this doesn’t arise very often. For the past year I’ve been advocating for vaccinations for children in the developing world through the UN Foundation’s Shot@Life campaign and the GAVI Alliance (Global Alliance for Vaccines and Immunization). I resonated with the cause when I first found out that every 20 seconds a child dies of a vaccine preventable disease. I also think of the mothers around the globe losing their children, and I related to them with my own memories of pregnancy loss. I want more mothers to have their healthy children in this world with them. In the past I have asked the universe to save my pregnancies, and I’ve had many that have failed. It turns out a chromosome disorder was causing the problem, and there was nothing anyone could do to save them. It was tough luck, and it hurt. A lot. I mean, roll off the bed, nose in the tear-filled carpet kind of hurt because I just couldn’t sink any lower. Ask any mother who has suffered a miscarriage and who was hopefully wishing for a baby in her arms. So, when I think of a mother somewhere out there losing a child to diseases like diarrhea and pneumonia that we can prevent, I hear her pleading to the universe for someone who can help. And, I’m rising to her call and soon will be on a plane to Uganda to tell her through a hug or a high-five that I’ve got her back, because I’ve dipped into that darkness, a darkness introduced by my own losses. Now that I know it, I want to prevent other mothers from having to experience it. EVER. 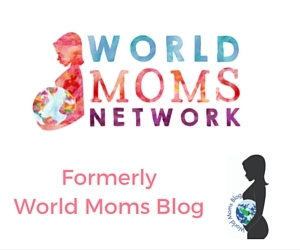 I’m also inspired by how my friends and colleagues have run with their advocacy through our website, such as World Moms Blog contributors Nicole Melancon, Kyla P’an, Purnima Ramakrishnan, Denise Paredes, Maman Aya and Lady E. And, friends of World Moms Blog, Jodi Fendrick, Amy Pohl, and the ladies of my local MOMS Club in New Jersey. I must add an additional — I’m-floored-by-what-one-woman-can-do-shout-out– again to Nicole Melancon, World Voice Editor for World Moms Blog and owner of the Thirdeyemom. She has become an unstoppable Champion to end world poverty (before she engaged with Shot@Life she had single-handedly raised enough money to have a school built in Nepal), and the children she advocates for are so lucky to have her on their team. So, being brave and leaving my very much-loved (as in my heart beats for them) family behind for one week to further embed my advocacy is tough, no doubt. But, I’m so thankful for the life, opportunities, and access to great healthcare that my family has, here, in the US, and I believe everyone deserves access to the same. There is a reason why we all advocate for global health, and I’m pretty sure that this is just the beginning of what we can do. I invite you to follow the upcoming Shot@Life trip to Uganda on World Moms Blog, as well as on Twitter and Facebook. And, if you, too, are inspired by giving more children a shot at life, sign up with Shot@Life, throw a Shot@Life event, or ask us about throwing a GAVI Global Tea Party. Have you ever advocated for people you haven’t met yet? What do you think it would be like to meet people who are benefitting from the programs you support and seeing those programs in action? This is an original post to World Moms Blog by Jennifer Burden of New Jersey, USA. Photo credit to Steve Burden. Jen, you are truly inspiring. You’ve found your calling and we are all so proud of you! Have an amazing trip. These women are lucky to have you advocating for them. Thank you for your support! And, for orchestrating our social media from Malaysia. The blog is great and gets opportunities like this because of all the amazing women like you who volunteer to keep it running. I’m thrilled to be representing you all. May this be the beginning of cool travel and social good opportunities for World Moms Blog contributors! Jen, I feel your passion for the cause and I’m sure your family, especially your daughters, will be so proud of what you are doing! Thank you, for being such an inspiration! Thank you. I’m so glad you resonate with the cause, too, all the way from Singapore! Having you all behind me, helps me to be brave! I totally agree with everything that Alison and Ruth have already said! That means the world!! “My life has taken on a whole new meaning since I joined WMB.” Mine, too!!! I’m so glad that you’re a part of the blog from South Africa. And, I’m definitely taking you all virtually along! I can’t wait! Yaaaaayy!!! You are my idol, Jeannine — a fantastic role model for bloggers, women, people everywhere!! I’m so inspired by your recent trip to Ethiopia with ONE, and loved following the #ONEMoms. I will catch you on Twitter while in Uganda! Thanks so much for your support. If I was to compile a group of women (living and dead) that I would want to have a dinner party with – you would NO DOUBT be on that list, I’d sit you in between Frida Kahlo and Marie Antoinette! I am so grateful I met you in college, you really have inspired me as a woman and mother in so many ways. I am so proud of you! I cannot wait to hear all about your trip!! Thank you for your amazingly kind words!! I wish you lived next door, so I could send my kids over for art classes!! Congratulations again Jen!!! We all can’t wait to hear all about it! Thank you, Nicole!!! I can’t wait to go and report back, and I look forward to following your future adventures, too! Amazing post Jen, you are such a worthy advocate for these mothers and children who benefit from shot@life programs. I can’t wait to follow along on your trip to Uganda. Hi to you in Prague, Elizabeth! You are also a social good force to be reckoned with, and I am so grateful for your support! I am surrounded by the most AMAZING women at World Moms Blog!! Go Jen! I love this cause. Thank you, Jennie, for stopping by from France! I’m so glad you’re on board! 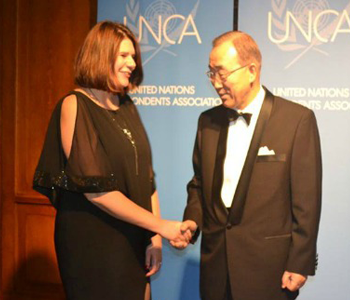 Dear Jen, I am not at all surprised by UN’s invitation to you. You are such an inspiration for all of us here. Thank you for representing all of us as part of WMB. I look forward to hearing about your experiences in Uganda. Hopefully we all do our little part too in helping make this world a better place to live for the future generations to come. Love. Thank you for your support in India! I’m so thrilled that World Moms Blog will be represented in this delegation to Uganda, and I’m thrilled for the opportunity to do more advocacy for children for all of us!